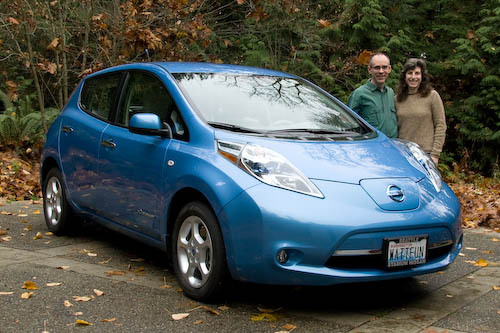 In September, we finally got our Nissan Leaf. We had signed up very early in the process, and could have had a Leaf in the spring of 2011, but we decided to put our order on hold until they offered the cold weather package. It was worth the wait! It's now our primary vehicle and we've put just over 2,000 miles on the odometer. Here's our review of the experience so far. Driving Experience We've been driving electric since 2008, so it's easy for us to forget how much better the driving experience is with an electric drive train. The accelerator pedal on the Leaf gives instant, smooth response: you push, it takes off. There's no waiting for a gear shift, and no slow climb to full acceleration the way you have to wait for a gas car to rev up the engine speed to maximum torque, then have to shift gears and repeat. It's just smooth, rapid acceleration all the way. I'm sadly reminded of this every time I fly somewhere and am forced to rent a clunky gas-burner. 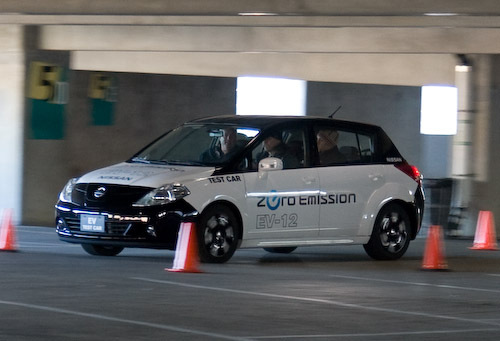 Braking The Leaf also features regenerative braking. In a gas car, if you want to slow down you have to hit the brakes. This costs you money twice: you're throwing away the kinetic energy of the car and you're wearing out your brake pads. With regenerative braking, you use the motor as a generator to slow the car and charge the battery pack, plus you avoid wearing out the brakes. 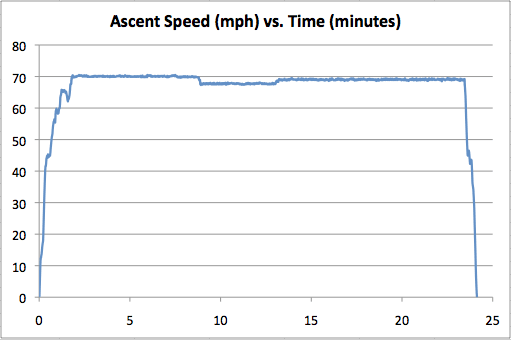 Even more than the cost savings, regenerative braking shines when going down a hill. In a gas car, you have to ride the brakes or downshift. Riding the brakes is bad as it heats up the pads and can present a safety issues on long downslopes. Downshifting, or engine braking, is better except that you have to chose one of a few gears. With regenerative braking, you can smoothly control your speed with your right foot, whether you're accelerating up to speed, or holding your speed going downhill. Friction brakes work just as on a gas car when you need to stop quickly. Controls The Leaf has a built-in touch screen for controlling the navigation system and the audio system (AM, FM, CD, iPod/MP3 player, and the ability to subscribe to satellite radio), as well as viewing car information and setting preferences. There are tactile controls on the steering wheel for the audio system and cruise control, and tactile controls around the touchscreen so you can control the vital systems by touch without taking your eyes off the road. Backup Camera The 2011 Leaf SL package adds a backup camera displayed on the large center console screen. With the camera, it's so much easier to back up whether it's out of a parking spot in a crowded lot, backing into a spot, or just being able to back up against an edge or wall when getting out of a tight spot. I'm now spoiled and miss this feature when driving a car that doesn't have it. Touchless Keyless Entry The Leaf detects the keyfob wirelessly so that when you are right next to the car, you can just push a button on the handle to lock or unlock the doors or the hatch. You don't have to fumble to pull your keys out of your pocket or purse, which is incredibly handy when you have an armload of groceries. It's the same for starting the car, no fooling with a key, you just push a button and the car starts as long as the fob is inside the car with you. The car knows the location of the keyfob with enough precision that it won't let you lock the keys in the car and can warn you with a beep if you get out of the car without turning it off. Quiet Ride It's widely reported that electric cars are quiet; some even wrongly claim they are silent. Electric cars don't have noisy internal combustion engines that have to be muffled. At low speeds they can be surprisingly quiet, although you quickly learn to recognize their unique sound even when they creep up slowly behind you. At speeds above 20 mph or so, they make the same noise as a typical gas car does, which consists mostly of tire noise. That's the story outside the car. Inside the car, it's tricky to do a good job of insulating road noise while keeping the vehicle weight low to maximize efficiency and range. Even if you get rid of the dominant road noise, you just make it possible to hear all sorts of little sounds that you wouldn't notice in a less insulated car. This is especially difficult when there's no engine noise to mask other drivetrain noises. This is the reason for the Leaf's unusual protruding headlights: they deflect airflow around the side view mirrors to get rid of a wind noise you wouldn't even notice in a noisy gas car. Our two other electric vehicles sound just like the Leaf from the outside, but inside the Leaf is a completely different experience, by far the quietest riding car we've ever owned. I haven't seen the data, but I suspect it's on par with heavily sound engineered luxury sedans that cost far more than the Leaf. Cold Weather Comfort Because the Leaf uses electric power to heat the car, it doesn't have to wait for an engine to heat up before it can start blowing warm air. 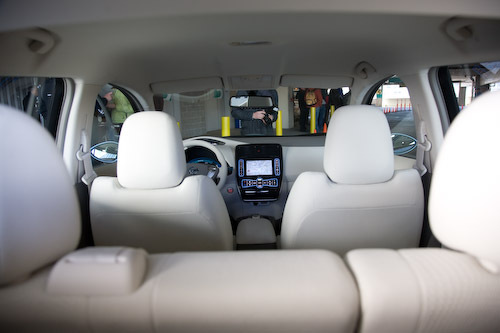 The cold weather package (now a standard feature on the 2012 Leaf) adds heated seats (front and rear), heated side mirrors, and a heated steering wheel. If you're driving in the cold, there's nothing more wonderfully decadent than a heated steering wheel. With the cold weather package, the heated seats and the steering wheel get warm even faster than the cabin air. The cold weather package also adds a battery heater for really cold climates. That's not an issue in Seattle where we rarely see temperatures below 20�F, but is important in more extreme climates. Remote Control and Monitoring Using a wireless communications system called Carwings, we can monitor the car remotely to check things like the state of charge. The system sends us a text message if we pull into the garage but forget to plug in. We can also tell the car to pre-heat from our phones. This is something that just can't be done with a gas car sitting in your garage where running the engine would fill the garage, and possibly the house, with deadly carbon monoxide. If the car is plugged in, it uses grid power for the pre-heating, so it doesn't reduce our range. Most of the time, our driving is nowhere near any concern about range, so we use the pre-heat feature even when it uses battery power to warm the car for our return after it has been sitting in a cold parking lot. Fuel Cost At the US average cost for electricity (11 cents per kWh), the Leaf can drive 30 to 35 miles per dollar of electricity. If gas costs $4/gallon, that's the equivalent of getting about 130 miles per gallon, not in a gutless, rattling economy box, but in a quiet, comfortable car with excellent acceleration. If the savings in fuel cost is applied to a buyer's monthly car payment, the Leaf is an incredibly affordable car. Convenient Fueling The Leaf is best suited for local driving, which fortunately accounts for more than 90% of the typical American's driving. If you can use the Leaf for your local driving, you'll find plugging in overnight to be far more convenient than going to a gas station. Especially if you share a car, you've no doubt experienced the rude surprise of needing to make a detour to a gas station, spend time waiting in line, and pump gas when you're already running late. The Leaf is fully charged every morning with just a few seconds of effort required to plug it in at night, about as much time as it takes to plug in a cell phone. Charge time varies with how far you've driven, anywhere from a few minutes to eight hours, but it doesn't matter at all because it happens while you're sleeping. I know many people think charging time will be an issue, but I just laugh when I see people waiting in a 20-minute line to save a few pennies per gallon at Costco. Driving electric, I pay the equivalent of $0.99 per gallon of gasoline and fueling takes just a few seconds of my time per day. I can only imagine how long the line would be if Costco sold gas for $0.99 per gallon. I get that price and I can charge up in my garage where there's always shelter from the elements and never a wait. Nissan has done an amazing job with their first full production electric vehicle. It's the most comfortable car Cathy and I have ever owned. It's a wonderful car, with no competition whatsoever at any price when considering the comfort and convenience it offers plus the liberation of not being hostage to wildly fluctuating gas prices. However, Nissan got it wrong on two important aspects of driving electric. The good news is that new electric vehicle drivers will get all of the benefits mentioned previously before they notice these more subtle shortcomings. Increasing Range Anxiety Range anxiety is the irrational fear of running out of power even when an electric car has plenty of range for your driving needs. 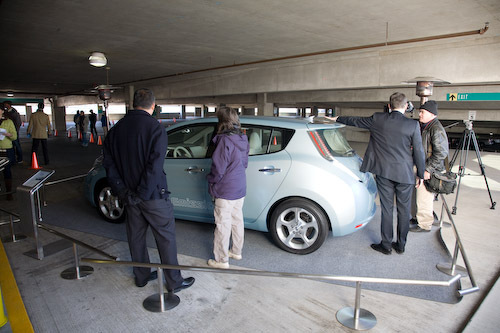 The way the Leaf presents information about the car's state of charge causes range anxiety. The dash shows in large numbers an estimate of your remaining range. That sounds pretty reasonable, but it has to make an assumption about how you will be driving for the rest of the trip. The Leaf assumes you'll be driving the same as you have been for some unknown period of time. Unless you do all of your driving under exactly the same conditions, same steady speed and constant slope, that estimate is going to be wrong pretty much all the time since it fluctuates wildly as conditions change. The best information we get is a 12-segment display that displays the state of charge in approximately 8% increments. The problem is you can't tell where you are in the bar. Suppose I drive from work to the grocery store and the gauge drops from 8 bars to 6 bars. That could be from the top of bar 8 to the bottom of bar 6 (almost three bars, or 24%) or from the bottom of bar 8 to the top of bar 6 (just over one bar, or 8%). That's a big difference. While the estimated range can be useful in some circumstances, Nissan should give us a way to display the car's state of charge as a percentage. I understand that there is some inherent uncertainty in computing the precise amount of energy remaining, but the raw state of charge should be presented to the driver with the same precision as the estimated miles. 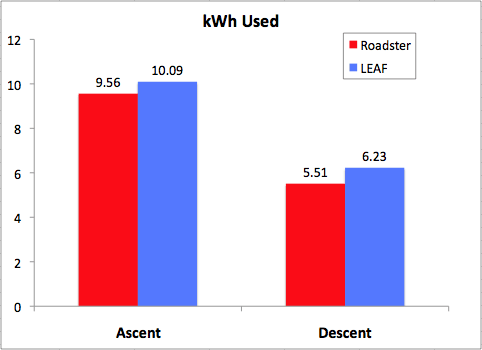 Having this information would help drivers better understand their energy use and increase the Leaf's usable range. This is such an important piece of information that owners have figured out a way to display the state of charge by tapping into the Leaf's on-board diagnostic port. Denying the Best Feature of Electric Driving The regenerative braking offered by an electric car dramatically improves the driving experience. Once you get feel of driving electric, it's a joy be able to control your speed with just one pedal: push down to speed up, lift to slow down. Whether it's uphill or downhill, speeding up an on ramp or slowing down for an exit, you do it all with the accelerator pedal. It's far more natural than how it works on a gas car, it's just different from how we all learned to drive. Nissan was apparently concerned about making the Leaf feel as much like a gas car as possible so as not to scare away consumers afraid of change. To do this, they have two modes, normal and economy mode. In normal mode, there's a limited amount of regenerative braking on the the right pedal. In economy mode, there's more regenerative braking, but acceleration is dampened out. You can get the same acceleration in eco mode as normal mode, you just have to push the pedal farther down. I want maximum regenerative braking, so I always drive in eco-mode. This makes the accelerator less responsive unless I really push it. 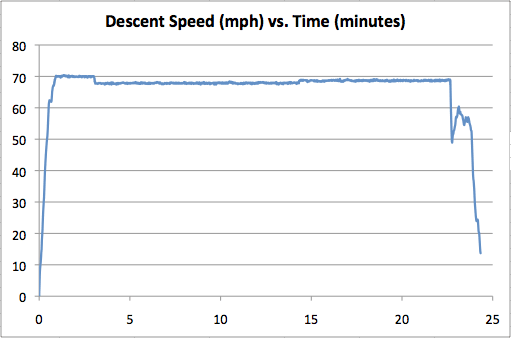 I would much prefer a more typical pedal response with the maximum regenerative braking. It's also annoying that the drive mode doesn't persist, I have to put it into eco-mode every time I start driving. Nissan clearly leveraged what they learned from making the world's first factory-made lithium-ion electric car over ten years ago* to create an incredible first generation production electric vehicle. The comfort features of the Leaf make it worth the sticker price, even if it had a gas drive train. 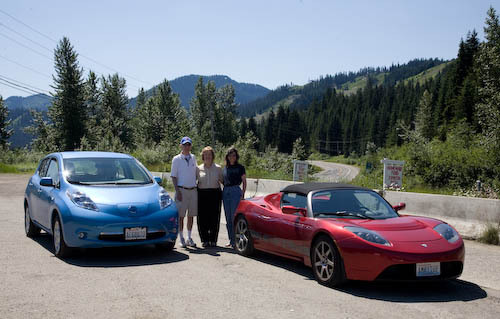 With efficiency that can't be matched by an internal combustion engine and fueled with cheap domestic electricity, the savings in total cost of owning and driving the Leaf make it the uncontested winner in value for its class of comfort and driving experience, in many ways superior to all gas-powered cars at any price. Add in the environmental benefits and the satisfaction of knowing your fuel dollars stay in the US instead of pouring into the global oil market that threatens our national security as well as our economy, and no other car on the market offers the value of the Nissan Leaf. If you're in the market for a new car, and typically drive under 60 miles per day, and already own a gas car that you can use for those few longer trips, you owe it to yourself to test drive a Nissan Leaf before investing in another gas car. * The all-electric Nissan Altra built to satisfy California's short-lived zero-emissions mandate from 1997 to 2003.